• Who says you need to have a lively young arm to be a successful big league pitcher? With the shutout he tossed on Saturday against the Miami Marlins, 42-year-old, former Montreal Expo Bartolo Colon has now hurled 25 consecutive scoreless innings for the New York Mets. But Colon is not the oldest active pitcher in MLB. That honour belongs to soon-to-be 43-year-old, Toronto Blue Jays reliever LaTroy Hawkins, who has allowed just one earned run (0.79 ERA) in 12 relief appearances since joining the Jays on July 28. And let’s not forget that 40-year-old R.A. Dickey, the fourth oldest active player, is 7-0 with a 2.78 ERA in 10 starts since the all-star break. 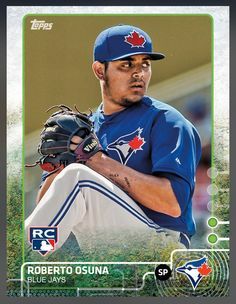 • In last week’s column, I mentioned that Blue Jays closer Roberto Osuna needed a nickname. I recommended that Señor Smoke – the nickname of late Detroit Tigers reliever Aurelio Lopez – be resurrected. But one of my blog readers named Maya suggested that “Osuna Matata” would be appropriate. Maya says that “Osuna Matata” translates to “No worries for the rest of our days.” And apparently the t-shirts have already been made. • Twenty-two years ago today, Montreal-born left-hander Denis Boucher made his Montreal Expos debut in front of more than 40,000 fans at Olympic Stadium. With Windsor, Ont., native Joe Siddall catching and Maple Ridge, B.C., native Larry Walker in right field that day, the contest represented the first time in modern baseball history that three Canucks have been in the starting lineup for the same team. Boucher held the Colorado Rockies to one run in six innings and recorded the win in the Expos’ 4-3 victory. • Please be careful if you’re buying items signed by Blue Jays third baseman Josh Donaldson online. There has been a rash of fake Donaldson signed photos sold by a Canadian vendor on a major auction site this past week. If you want a real Donaldson autograph, please either get it in person or do your research and make sure you’re buying it from a reputable company. • Speaking of Donaldson, remember that limited edition rookie card (just five were made) of the Blue Jays third baseman that I mentioned last week? It ultimately sold for $2,890 on eBay on August 30. This card features a Donaldson autograph that has a statement of authenticity from Topps, a company that has been making baseball cards since the early 1950s, right on it. So if you want to see what a legitimate Donaldson autograph looks like, you can find the card here. • The Canadian Baseball Hall of Fame will host its second annual Baseball Fan Appreciation Luncheon at the Albany Club in Toronto on September 18. Roberto Alomar, George Bell, Lloyd Moseby, Duane Ward, Paul Beeston and Alex Anthopoulos will be among those in attendance at the event, which will raise money for a new baseball shrine in St. Marys, Ont. For more information, click on this link. • Do yourself a favor and watch, There’s No Joy in Beachville: The True Story of Baseball’s Origin, an excellent Sportsnet documentary. London, Ont.-based author Brian “Chip” Martin shares his expertise and some of his research from his groundbreaking 2013 book, Baseball’s Creation Myth: Adam Ford, Abner Graves and the Cooperstown Story, in this documentary. You can watch the documentary here. I’d also strongly recommend that you buy Martin’s book here. • Eighteen years ago today, Maple Ridge, B.C., native Larry Walker belted his 195th big league homer to pass Jeff Heath (Fort William, Ont.) for the most hit by a Canadian. Walker went on to club 383 home runs. Matt Stairs (Fredericton, N.B. ), Justin Morneau (New Westminster, B.C.) and Jason Bay (Trail, B.C.) have also since passed Heath on the all-time Canadian home run list. Nice job, Dan! You are correct. Can you drop me an email at kevin.glew@sympatico.ca and I will mail the McCovey and Brock cards out to you. Thanks very much for participating! Great stuff as always Kevin! thanks for all these great pieces Kevin. As long as Roberto keeps pitching well people can call him anything they want. Great Canadian moments with Walker, Boucher, Siddall. Thanks for the kind words, Scott. I agree with you about Osuna.